Product prices and availability are accurate as of 2019-04-18 20:04:44 EDT and are subject to change. Any price and availability information displayed on http://www.amazon.com/ at the time of purchase will apply to the purchase of this product. Sony’s S-series TVs put amazing picture quality and stunning dynamic contrast in reach for value-oriented consumers who want to step up into the Sony Full HD 1080p experience. 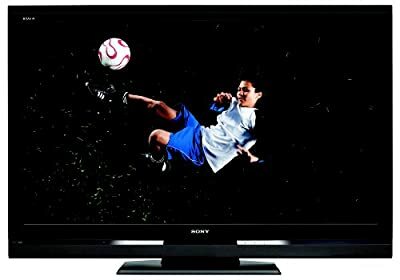 These TVs represent the entry-level models in Sony’s large screen offerings in 2009 and offer the superior resolution and contrast, advanced image processing features, and variety of HD input options available on high-end BRAVIA HDTVs -- all in an affordable package. With three HDMI connections, you can hook up a Sony PlayStation3 entertainment system, Blu-ray Disc player, or any other HDMI-capable equipment and get uncompressed digital video and multi-channel digital audio on a single cable. You also have numerous other HD connection options, including YPbPr Component inputs as well as a PC input for using your laptop or desktop PC with your big-screen HDTV. No matter which HD source you use, the exclusive Sony BRAVIA Engine 2 fully digital video processor ensures that images look sharp and brilliant. With BRAVIA Link compatibility, you can easily expand your high-resolution home theatre set-up with optional BRAVIA Wireless Link, BRAVIA DVD Link, or BRAVIA Input Link Modules. And BRAVIA Sync makes controlling everything a snap. Additionally, BRAVIA S-Series HDTVs exceed Energy Star 3.0 requirements by incorporating advanced power saving features such as Light Sensor technology that adjusts backlight intensity based on ambient room lighting conditions and Dynamic Backlight Control that adjusts backlight intensity based on the brightness of the image on the screen. Utilizing these features can reduce power consumption by up to 60% in a typical home theater environment.